A hopper extension allows a pellet burning appliance to burn for longer periods between refueling by increasing pellet capacity. Increases hopper capacity to 100 lbs. Two can be stacked to increase capacity to 160 lbs. 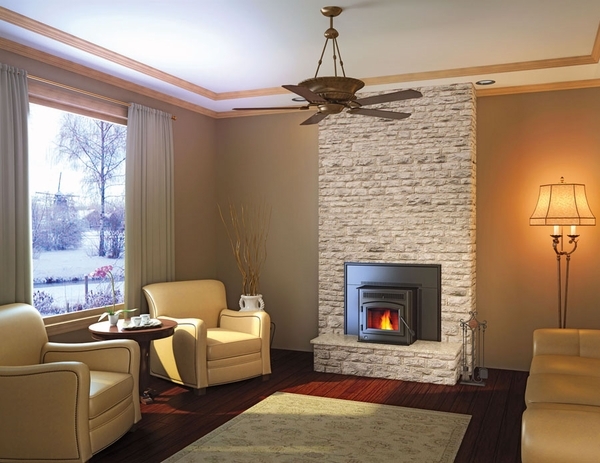 Minimum Fireplace Opening: 22" W x 21" H with an adjustable depth of 10 1/2" to 12 1/2"
Wood has always been an ideal fuel source in terms of cost-efficiency, but it's not entirely environmentally-friendly. Enter the wood pellet. Equipped with a high-quality pellet appliance like this Timberwolf TPI35 Pellet Burning Fireplace Insert, you can enjoy the economic benefits of wood heating without any of the environmental drawbacks. You'll also find that, like wood-burning models, pellet inserts produce much more dynamic flames than those powered by gas. Simply put, a Timberwolf TPI35 Pellet Burning Fireplace Insert will allow you to get more heat for less money and less effort. And it will have very little impact on the environment. As a budget-minded homeowner and an eco-conscious consumer you really won't find a better secondary heat source. PLEASE NOTE* There is a required flashing that must be purchased with this unit to complete installation. That flashing constitutes an additional purchase and is listed on this item page. Is this Napoleon Timberwolf TPI35 pellet burning fireplace insert zero clearance? This insert may be framed into a combustible enclosure per the instructions provided on pages 23-25 of the installation manual. Can this be used as an insert in a prefabricated fireplace? Yes, as long as the prefabricated unit offers enough space and is rated to handle an insert. Can I run this stove on a generator if I have a power failure? Certainly. The stove can function properly on any source of 115 volt power, with a circuit limit of 15 amps or greater. So, in the event of a power failure, you would indeed be able to plug the unit into a generator to continue use of the insert. Can I vent this directly out the wall rather than a chimney? You could certainly vent this stove insert directly through a wall for a horizontal termination. The unit must be installed to the clearances as outlined on page 23 of the owner's manual if built in place. This TPI35 insert weighs 140 lbs. Is this compatible with corn pellets also? No, the TPI35 is only tested and approved for use with wood pellets. What's the maximum vent height with this pellet insert? The maximum venting height on this insert is 33 feet, per the manufacturer. Is flex pipe or solid venting better for this model? While you can use either solid or flex venting on this insert, it is most common to use a solid tee on the back of the appliance, then convert to a flexible liner for the remainder of the run. Due to the construction of most chimneys, it can be prohibitive to use a rigid piping system. I am quite happy with this insert. I bought it and installed it myself, super easy installation and the instructions are decent for various types of installations. I haven't used it very much yet but it will be my main source of heat through the winters. I like the large hopper size and easy operation. 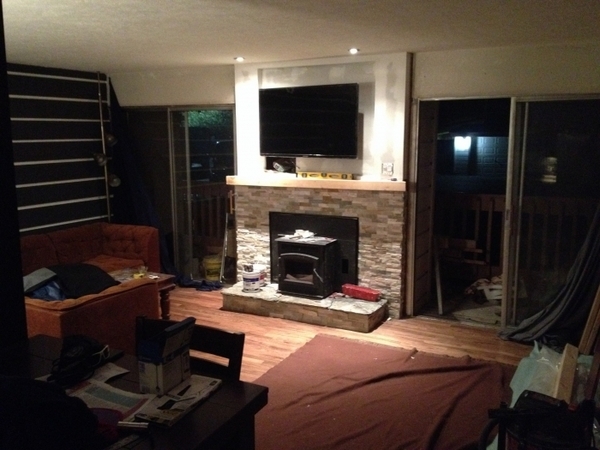 it sticks out more than I really wanted but I designed and built my own hearth so I made it work and it looks great. Prosinstallation, price, easy operation, easy installation. I have had problems with this insert from day 1. If it was easier to return I would have. First the prime control button has never worked. Second the paint started chipping in non contact areas after 1 month. Third the auger motor failed after 13 months; Napoleon/Timberwolf would not replace it because I was past the one year mark. Four, I am on my third season; 1 month of use after a new auger motor and it seems to be failing again as the heat control setting do not produce as much heat as they used to. I am so disappointed with my purchase, I will never buy another Napoleon product again. This is not a reflection of efireplacestore as they are great to work with. Fast service without any problems. Stove was packaged with everything as ordered. Install was easy. Two person install but could have done it alone. ProsGreat stove so far...easy to operate and looks good...Price was right and was rated the third stove on the market. ConsGreat stove but had to check all wires because it wouldn't work. I did read other reviews so was ahead of the game. The hopper as others had said doesn't really allow the pellets to fall all on there own so I have to check on them and push them down. The flame doesn't stay consistent but not sure if that's normal for pellet stove. 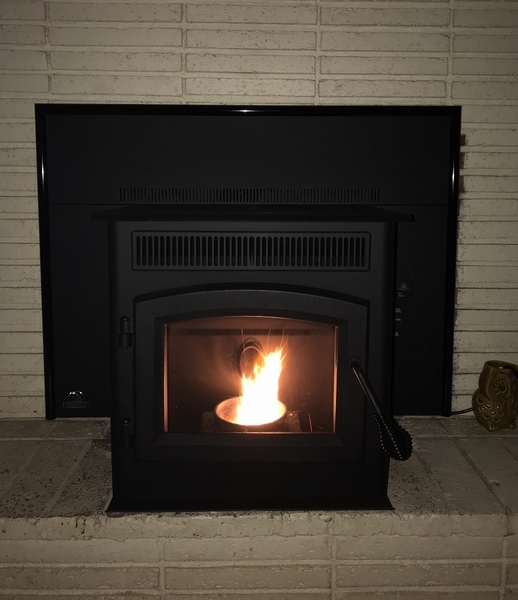 Other than that, the stove works great...I just hope it has a long life before any issues...It has great reviews and seems to be the third rated stove on the market. Very happy with the insert. Had a few problems with install (make sure to check that all screws/pins/other are in place as some may come loose during delivery.) We had the screw to the auger come loose or broke and caused a problem. Very easy to use. Shipped very quickly. Very lightweight and easy to assemble. Installed with a liner kit in a day. Ample heat at medium fan speed to heat my house which is approximately 1200 sq ft.
ProsVery quiet operation, and minimal maintenance. Sleek appearance and smooth installation. ConsOnly flaw in my opinion is the hopper shape, which requires more attention than expected. The pellets don't seem to always fall into the auger by gravity and occasionally need to be pushed towards the auger manually.